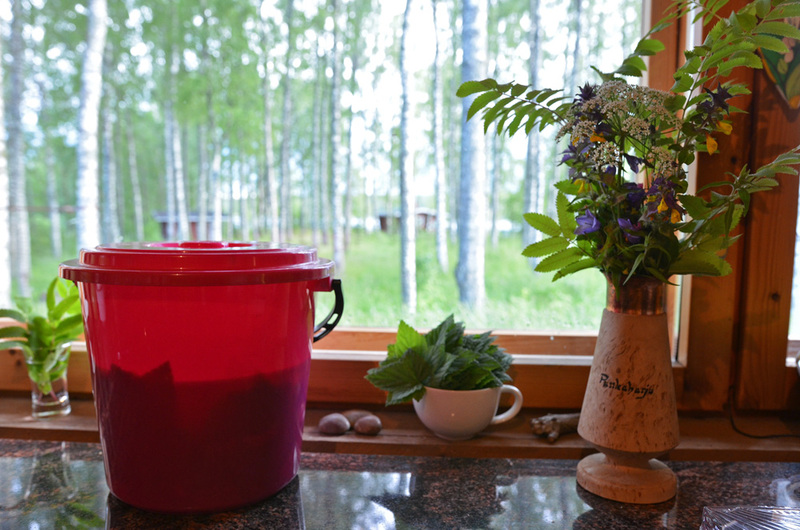 This summer I decided to do something that I had planned already for years; make traditional Finnish blackcurrant leaf drink – Louhisaaren juoma – that is. I had a good reason for it, too. 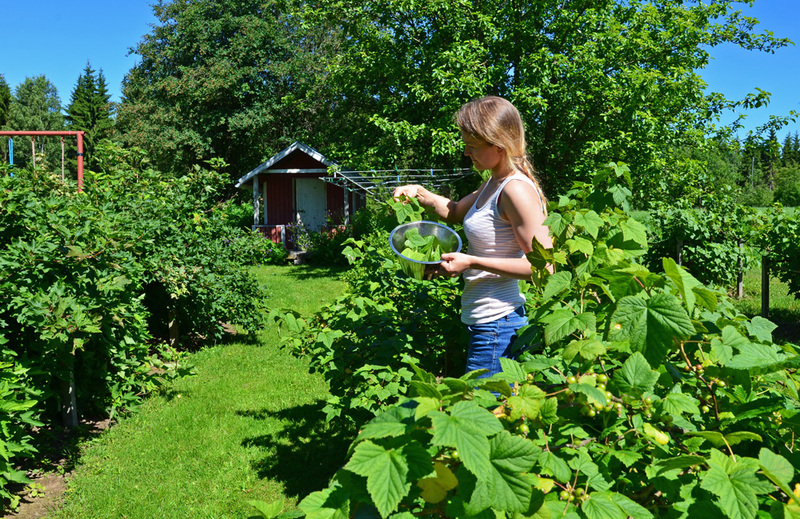 Towards the end of the summer we were expecting many foreign guests. 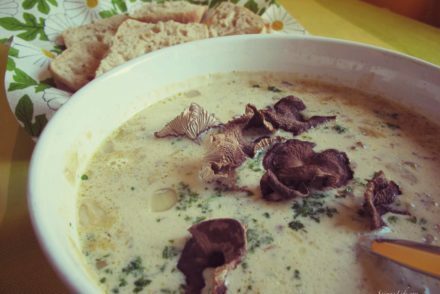 When I was planning what to serve them, this delicious summer drink came instantly to my mind. 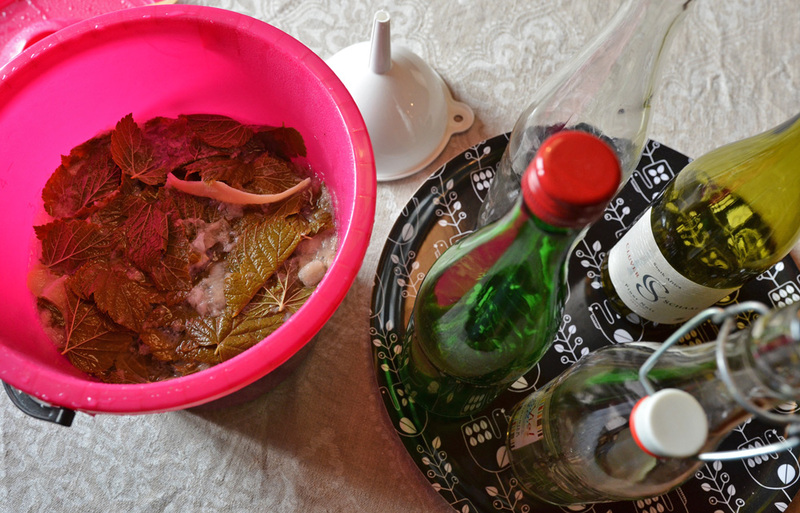 When making Louhisaaren juoma, you start with the blackcurrant bush by picking the leaves that are the main ingredient of this drink. Note! 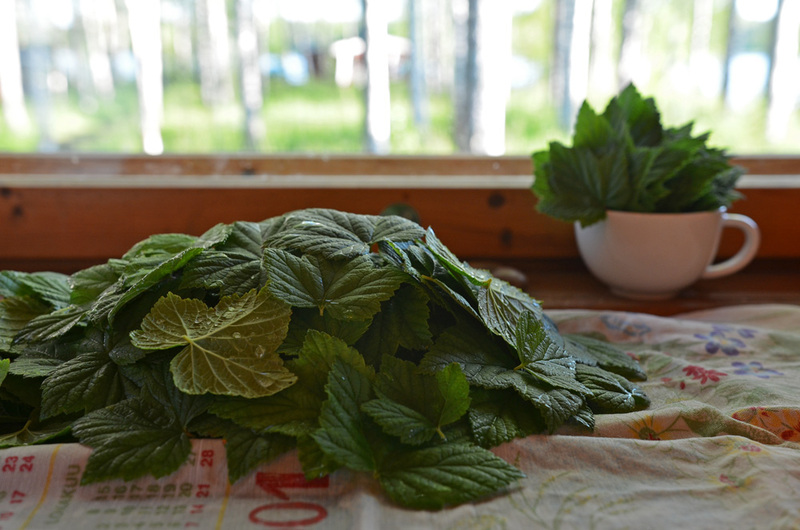 Even though this is said to be a summer drink, you can also make it in the winter because the leaves keep their aroma pretty well when you freeze them fresh. If you don’t have fresh yeast, you can use dry yeast instead. I haven’t used it myself, but I heard that it works, too. Wash also the bottles, if needed. While the water boils, peel the lemon and save the peels for the drink later. Take all the white parts off the lemon and throw them away. 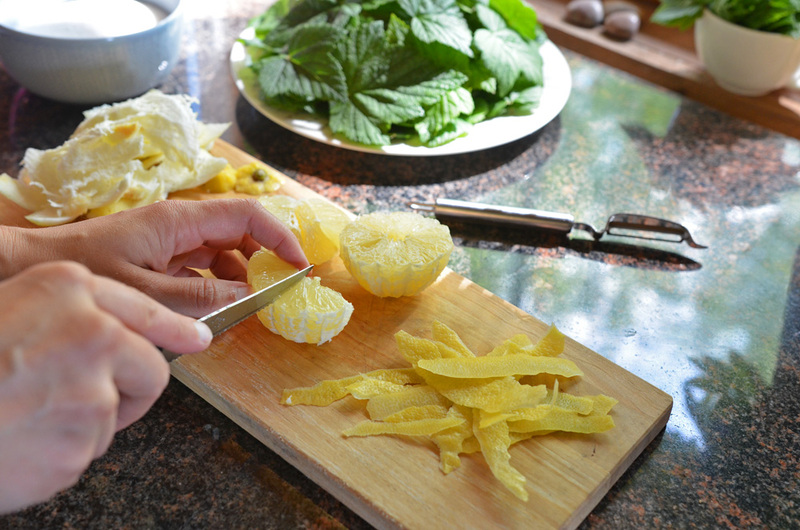 Chop the lemon into small pieces. Add the leaves, lemon peels, lemon pieces and sugar into a large punch bowl. This is important! Let the drink mix cool down until lukewarm before adding the yeast. When the drink mix has cooled down, blend a pea-size peace of fresh yeast into a small amount of water and add it into the drink mix. 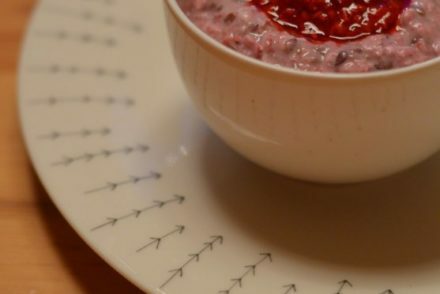 If you are using dry yeast, just follow the instructions in the package but take note of the small amount of yeast that is needed in this recipe. 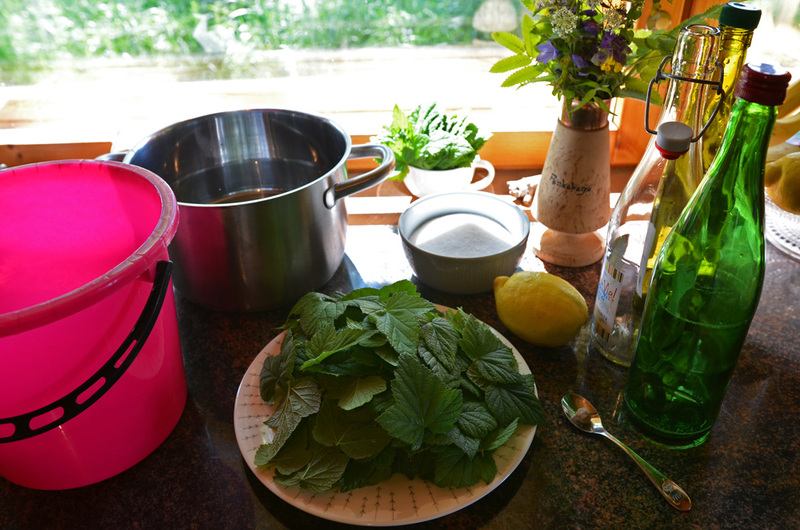 Cover the punch bowl with a lid and let sit in room temperature for about 24 hours. The next day, sift and bottle the drink. 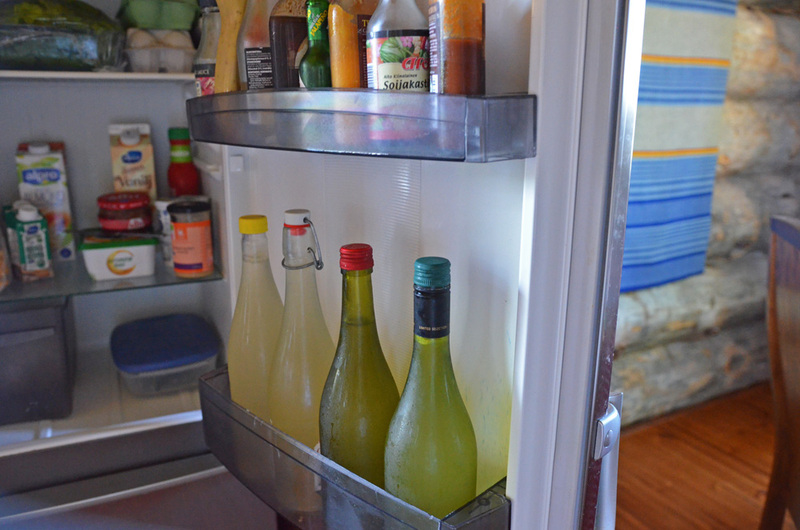 Keep the blackcurrant leaf drink bottles in the fridge for about 3 days. After that the drink is ready to be served! 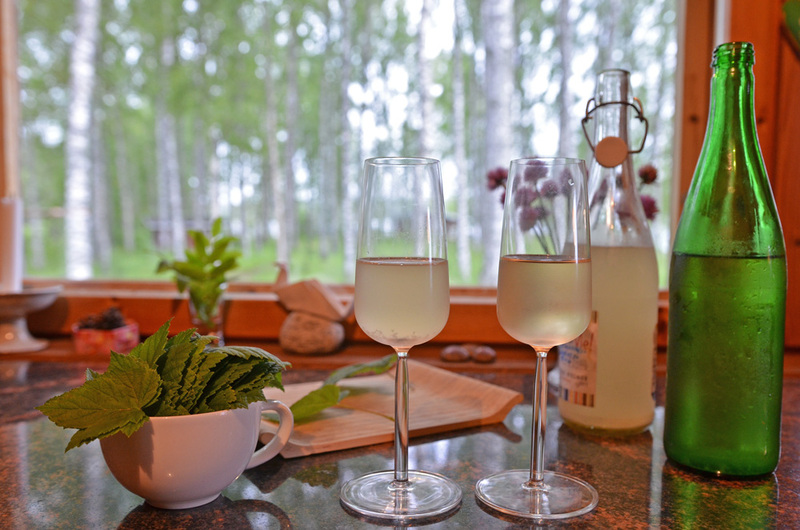 This time the drink was as its best on the third and fourth day after bottling. When sharing my Finnish Cabbage Casserole recipe, I gave you both the traditional and modern version of the dish. Well, there are two versions of this drink, too, so I tested them both this time to find out which one is better. 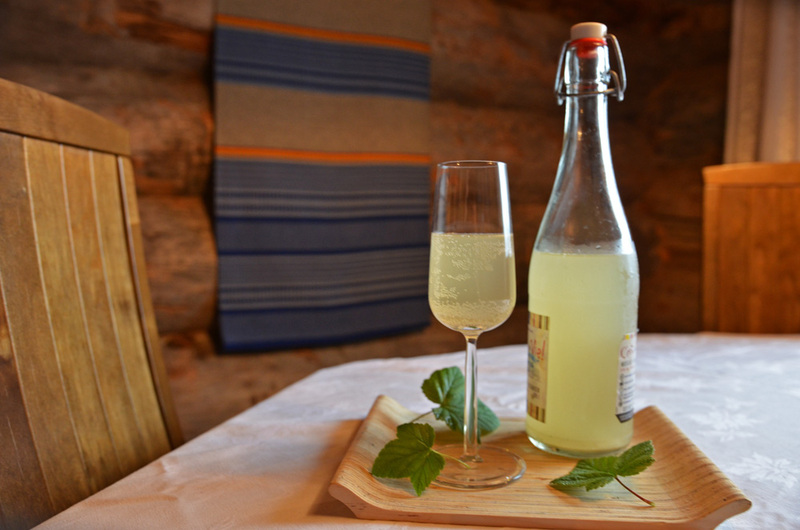 The recipe above is the traditional version of Finnish blackcurrant leaf drink. 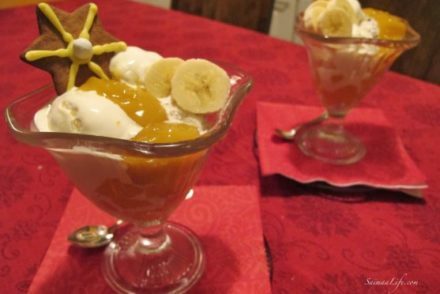 In the modern version, you replace fresh lemon and yeast with citric acid. Also, sugar is added to the drink only after 24 hours in room temperature. You want to know the result of our testing? Check out the result in my 360 video here. 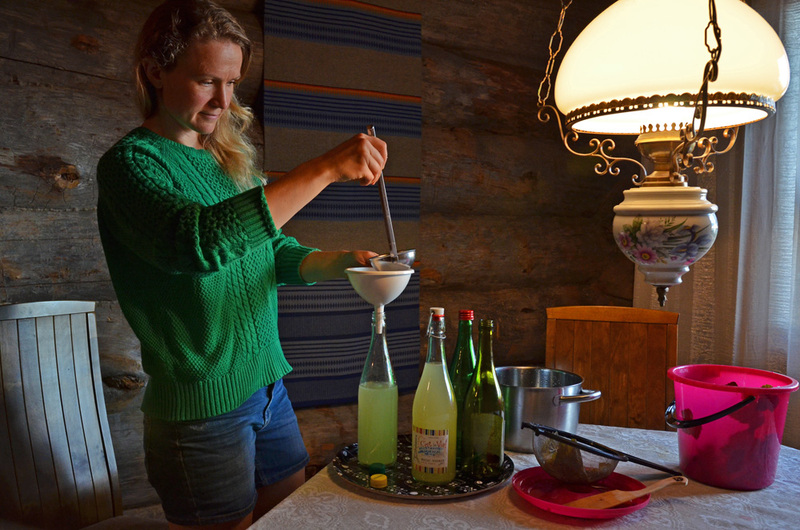 However, I invite you to watch the whole video and join me in making this bubbling summer potion and hearing more about Louhisaaren juoma and its history! For the best experience, please watch this 360° video in Youtube app with virtual reality headset and remember to turn on HD! Tap on Youtube icon in the player below or open this link https://youtu.be/Rnp24FzW2r0 in your Youtube app.